Terrace farming is a type of farming that was invented by the Inca people who lived in the South American mountains. This farming method has made cultivation of crops in hilly or mountainous regions possible. It is commonly used in Asia by rice-growing countries such as Vietnam, the Philippines, and Indonesia. In fact, the terraces of rice found in the Philippine’s Cordilleras have been acknowledged as UNESCO World Heritage Site. 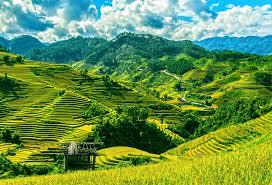 Apart from rice cultivation, terraces are also used to grow rice, potatoes, and maize. Terrace farming is also commonly used in islands such as the Canary Islands because they have hilly terrains. How Does Terrace Farming Work? Terrace farming is a method of farming whereby “steps” known as terraces are built onto the slopes of hills and mountains. When it rains, instead of rain carrying away the soil nutrients and plants down the slope, they flow to the next terrace. Every step has an outlet which channels water to the next step. This helps in keeping some areas dry and others wet. On very high altitudes, other crops apart from rice can be grown. This is because rice does not do well on high altitudes. There are two types of terracing known as graded terracing and level terracing. A graded terrace may have either constant or variable grades along its length. On the contrary, the level terraces follow a contour line and are best suited for permeable soil. Terrace farming prevents the washing away of soil nutrients by the rains. This leads to the growth of healthy crops. Secondly, it prevents the carrying away of plants by the heavy flowing rivers of water. Sometimes rainwater carries away the crops leading to low crop yield. Thirdly, terraces help in the reduction of soil erosion and water loss. The fourth benefit of terrace farming is that it has made the idle hillside land become productive. Lastly, terraces trap rainwater allowing the people to engage in cultivation of water-intensive crops such as rice. Terrace farming is an important agricultural method that has made farming in mountainous parts of the world possible. Its absence would have led to most parts of Asia being unproductive. Hence it needs to be explored in other parts of the world such as Africa, America and other parts of Asia that are not yet using it. Terrace farming is able to turn the moist idle land into productive farms leading to high food security in the world. It also helps in retaining the soil nutrients in the farms. Terrace farming can lead to rainwater saturation. This is dangerous since it causes the overflow of water during the rainy season. The consequence of overflowing water is that it causes more dangerous water runoffs. Terraces may also result in mudslides if not well managed. Another limitation of terrace farming is that there’s a need for huge inputs of labor to construct and maintain the terraces. Hence it is expensive as it is labor intensive. However, it can be cheap if there’s access to cheap labor. Terrace farming also leads to a reduction in soil quality due to the leaching process. 0 Response to "Terrace Farming Definition"